The publisher Ernst & Sohn, a subsidiary of the respected publishing group John Wiley & Sons, with its head office in Hoboken/New Jersey, was founded by Wilhelm Ernst and Heinrich Korn in Berlin in 1851, and is one of the leading specialist publishers for structural engineers in the German speaking countries. The range of publications now includes ten trade journals, four of which are in English, as well as special issues and numerous books in German and English. momentum, the online magazine for structural engineers and all those with an interest in construction, belongs to Ernst & Sohn as well. Keeping abreast of the speed of change in construction – an extremely dynamic industry – without compromising in terms of quality has been the publishing house’s mission for over 160 years. Ernst & Sohn will only accept contributions to books or journals which are scientifically well-founded and relevant for the practical work of engineers and architects. Whether at trade fairs, conferences, meetings in the publishing house or engineers’ offices – the on-going exchange with researchers and practicing engineers is the most important basis for planning our future titles and range of publications. In any case, there is a major meeting every two years: for the Structural Engineering Award which has been awarded by the publishing house since 1988. The last award by the professional jury in 2013 was the thirteenth time that special engineering achievements were recognised, and the publishing house is pleased to be honouring the art of building in this way. With the announcement of the 2015 Award, the Structural Engineering Award is being renamed as the Ulrich Finsterwalder Structural Engineering Award in honour of Ulrich Finsterwalder. 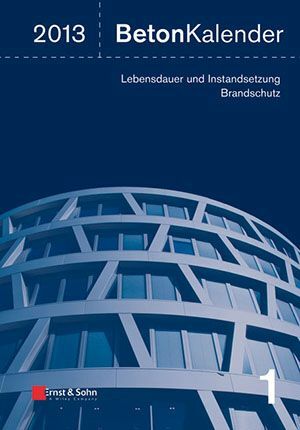 The publisher Ernst & Sohn, in collaboration with the descendants of Ulrich Finsterwalder, will thus continue the basic idea of the Structural Engineering Award, to promote the profession of civil and structural engineering in the public arena. The Concrete Calendar, first published in 1906, is the most important publication in the publisher’s history. In support of the Calendar, a portfolio of books has been developed, both in print and electronic form, which provides high-quality information in all areas of interest for practicing structural engineers. The range of subjects comprises all types of buildings and professional disciplines in construction: “classics” such as reinforced concrete construction and steel construction, structural design and calculations, building physics and geotechnical engineering, construction management and standards, as well as more specialist subjects such as traffic engineering, sports venue construction or hydraulic engineering. Whether with annual publications such as the Concrete, Brickwork, Steel Construction and Building Physics Calendars, with standard works comprising several volumes such as the Timber Construction Manual and the Earthworks Manual, or with monographs on individual subjects – with the books by Ernst & Sohn you are simply better informed. One of the best known works by the English team is Neufert’s Architects' Data, which was published in 2012 in its 4th edition. Long-term cooperation with societies such as the Deutsche Gesellschaft für Geotechnik (German Society for geotechnology) or the International Federation for Structural Concrete (fib) results in shared projects, not only in the form of journals but also as books, such as the title “Model Code 2010, EA Pfähle” (Model Code 2010, EA piles). Recommendations by the “Piles” working party and EBGEO - Recommendations for Design and Analysis of Earth Structures using Geosynthetic Reinforcements, or titles from the ECCS series such as "Design of cold-formed steel structures". Classic journals, such as Bautechnik and Beton- und Stahlbetonbau (Construction Technology and Concrete and Reinforced Concrete Construction) have been making an impact on the industry and Ernst & Sohn’s range of journals for more than 100 years. The journals Bautechnik, Bauphysik, Beton- und Stahlbetonbau, ce/papers, Geomechanics and Tunnelling, Mauerwerk, Stahlbau, geotechnik, Unternehmerbrief Bauwirtschaft and Steel Construction exclusively contain scientifically vetted contributions. The outstanding competence of the authors as well as a very committed team of experts in the publishing company is the foundation on which the quality of the journals – which have been ISI certified since 2007 – is based. The English language publications Mauerwerk - European Journal of Masonry, ce/papers, Geomechanics and Tunnelling, Steel Construction – Design and Research and Structural Concrete address professionals all over the world. Three journals are published by Ernst & Sohn in close cooperation with national and international associations. Steel Construction (journal for members of the ECCS – European Convention for Constructional Steelwork), geotechnik (organ of the DGGT – Deutsche Gesellschaft für Geotechnik e.V.) as well as Geomechanics and Tunnelling (journal for members of the ÖGG – Österreichische Gesellschaft für Geomechanik). More than 29,000 articles and reports from all journals since 1967 are collected in Ernst & Sohn’s database of articles. These and numerous other contributions are also included in the data collection of John Wiley & Sons, the Wiley Online Library (WOL). WOL is one of the largest multi-disciplinary scientific online collections worldwide, with access to more than 4 million articles from 1,500 journals, 9,000 books and other works. The publisher’s online magazine, momentum, is aimed at engineers – providing an entertaining read that is also accessible to the layman. In contrast to the professional journals, it reports in a relaxed way on the life and work of structural engineers. With this publication, Ernst & Sohn is trying to boost the image of structural engineers in society. It contains interesting and exciting reports on special construction projects – both large and small – interviews, historic information, curiosities and commentary. Ernst & Sohn has been located in Berlin since its formation in 1851. To this day, the publisher’s history has been influenced by a sense of euphoria and a pioneering spirit, top-quality engineering works and the joy of experimentation. Today, Ernst & Sohn’s range of publications is affected in the same way as its customers in their everyday work: the world is becoming more international, more digital and increasingly networked. The team members at Ernst & Sohn are not only international, experienced and innovative, but also experts in their field. Proof-readers and editors are structural engineers, and the media are developed by experts of state-of-the-art web-based publications. Supported by colleagues in other disciplines, the publisher has extensive marketing and advertising expertise. Thanks to its central location at its current offices at Oberbaumbrücke in Berlin, the publisher has excellent contacts with authors, customers and partners – and is well positioned for networking with Wiley colleagues all over the globe.